NEW YORK, July 17, 2018 – After a two-year process that included extensive input from computing professionals around the world, ACM, the Association for Computing Machinery, has updated its Code of Ethics and Professional Conduct. The revised Code of Ethics addresses the significant advances in computing technology and the growing pervasiveness of computing in all aspects of society since it was last updated in 1992. 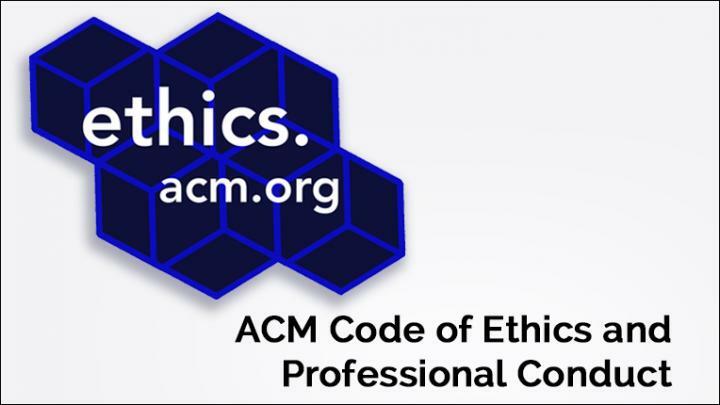 ACM's Code of Ethics is considered the standard for the computing profession, and has been adopted by computing professionals, organizations and technology companies around the world. ACM expects all of its nearly 100,000 members from 190 countries to abide by the ACM Code of Ethics and to make a commitment to engage in ethical professional conduct. Reflecting the prevalence of computing technology in our lives today, ACM's updated Code of Ethics adds new responsibilities for computing professionals in leadership roles to "recognize and take special care of systems that become integrated into the infrastructure of society" (Principle 3.7). Computing systems and society evolve in unexpected ways. The original intent of the system may become obscured as users adopt the system. The updated Code of Ethics calls on computing professionals to pay close attention to these changes in order to both recognize new ethical responsibilities and to ensure that appropriate care is taken to protect those impacted by their systems. "The best professional organizations make ethical conduct the foundation of their service to the community, and the most tangible expression of that commitment is a code of ethics," said ACM President Cherri M. Pancake. "So much has changed since ACM released its last Code of Ethics in 1992. Because computing is now inextricably linked into almost every aspect of society, the actions of computing professionals have more impact than ever before. It is imperative that everyone in our field act responsibly." "The Code represents the aspirations and the conscience of the profession," explained Donald Gotterbarn, Co-Chair of ACM's Committee on Professional Ethics (COPE) and Professor Emeritus at East Tennessee State University. "The Code has not been designed as an algorithm for solving ethical problems; rather it serves as a basis for ethical decision making. We've outlined overarching principles, explanations, and guidelines to steer decision making based on the understanding that the public good is always the primary consideration." COPE led the project to update the ACM Code of Ethics via a transparent, two-year process, seeking input and direction from computing professionals around the world. Drafts of the proposed changes were published in Communications of the ACM and posted on ACM's ethics.acm.org website, and throughout the process, ACM members and computing professionals more broadly were invited to comment, debate, and suggest edits to the document. Founded in 1947, ACM adopted its first Code of Conduct in 1972 (which was preceded by "Guidelines for Professional Conduct in Information Processing" in 1966). Twenty years later, after the development of the PC and other important innovations, ACM significantly revised the earlier document as a Code of Ethics and Professional Conduct. The ACM Code of Ethics has had broad application, and over the years it has been used to instruct students entering the profession, as a decision support tool for computing practitioners, as a standard for the public to judge the professionalism of practitioners, as a basis for the codes of ethics of other international societies, and as an aid to address legal and ethical issues. Concurrent with the release of the updated Code of Ethics, ACM is launching the Integrity Project–a series of resources designed to aid ethical decision making. The Integrity Project includes case studies demonstrating how the principles can be applied to specific ethical challenges, and an Ask an Ethicist advice column to help computing professionals navigate the sometimes challenging choices that can arise in the course of their work.